After three decades in a conference populated mostly by teams outside the Central time zone, the Detroit Red Wings moved to the Eastern Conference for the 2013-14 season. Their reward for making the Stanley Cup Playoffs for a 23rd consecutive season is facing the class of their new conference. The Bruins have represented the East in the Stanley Cup Final in two of the past three seasons, and this season won the Presidents' Trophy for the first time since 1989-90. Boston is an overwhelming favorite to reach the Cup Final for a third time in four years, but Detroit's season-ending surge makes the Red Wings a dangerous first-round foe. Boston is led by the best trio of down-the-middle players in hockey: goaltender Tuukka Rask, defenseman Zdeno Chara and center Patrice Bergeron. Rask is a favorite to win the Vezina Trophy, Chara should be among a crowded group of contenders for the Norris Trophy, and Bergeron is one of the top two or three choices for the Selke Trophy. Everything starts with the Bruins' spine and works out from there. The Bruins only wobble of the season came right after No. 2 defenseman Dennis Seidenberg was lost to a major knee injury, but the young defensemen improved and Boston remains the best team in East at possessing the puck and not allowing it to end up behind Rask. The Red Wings faced a struggle to extend their playoff streak for a second straight season, but again Mike Babcock's team ripped through the conclusion of the schedule to secure a berth. Last season the Red Wings knocked off the second-seeded Anaheim Ducks and had three chances to finish off the eventual Cup champions, the Chicago Blackhawks, before losing in seven games. Detroit has been ravaged by injuries this season, but general manager Ken Holland and his staff cultivated an enviable collection of prospects and this became their chance to shine. Forward Gustav Nyquist began the season in the American Hockey League and ended it on the fringes of the Hart Trophy discussion with an incredible goal-scoring surge. These two franchises have been in the League together 88 years. The Bruins were one of two expansion franchises in 1924, and Detroit, first as the Cougars then the Falcons before settling on Red Wings, followed two years later. They have squared off in the Stanley Cup Playoffs seven times, all between 1941 and 1957, with the Bruins winning four series. Detroit has won 266 times in the all-time series between the franchises, Boston has won 254 and there have been 95 ties. The Bruins have scored 1,848 goals, and the Red Wings have scored 1,846. 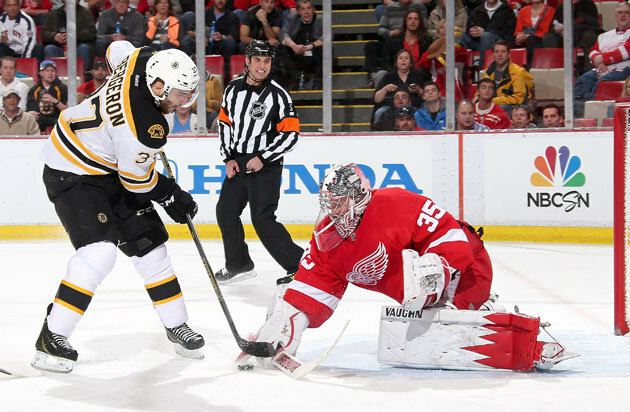 This season the Red Wings have defeated the Bruins three times in four games. Detroit was the only team in the NHL to have three victories against the Presidents' Trophy winners. One came April 2 to help solidify Detroit's place in the postseason and featured one of the highlight-reel goals of the season from Nyquist. The Bruins never lacked for production from their top two lines. The first line centered by David Krejci with Milan Lucic and Jarome Iginla on the wings combined for 189 points. Iginla turned out to be the perfect replacement for unrestricted free agent Nathan Horton with the 12th 30-goal season of his career. With Iginla around, Krejci and Lucic were more consistent than they've ever been in the NHL. Bergeron continued to play scintillating defensive hockey as the second-line center, and with 30 goals reached offensive totals not seen since his second NHL season (2005-06). Bergeron and left wing Brad Marchand continued to click as a pair, and Reilly Smith was a surprise addition to their line. Smith enjoyed a breakout year after joining Boston from the Dallas Stars via the Tyler Seguin trade. Smith's play in his own end allowed the Bruins to continue to match up the Bergeron line against opposing top lines. The Bruins' dominance came from being more than a two-line team once again. Injuries prevented their third line from coming together early in the season. Once the Bruins moved Carl Soderberg to center between Chris Kelly and Loui Eriksson, they were truly a four-line team. The fourth line of Gregory Campbell centering Daniel Paille and Shawn Thornton has been a Boston mainstay for four seasons. Although the production fluctuates, the Bruins always know the "Merlot Line" will provide a high level of effort and can be trusted in difficult situations. Despite the loss of several key players for long stretches up front, including Pavel Datsyuk, Henrik Zetterberg, Stephen Weiss, Johan Franzen and Daniel Cleary, the Red Wings persevered. Since coming over from the Nashville Predators in a trade last month, David Legwand has played a significant role and gives Babcock another offensive option in the Stanley Cup Playoffs. The biggest adjustment for Legwand has been playing a more effective game in his own end. The Red Wings have continued to play the same puck-possession style no matter who is in the lineup. Nyquist, who played three seasons at the University of Maine before turning pro, had a six-game goal streak in November and a 10-game point streak (12 goals, 14 points) from March 16-April 2, the longest streak in Red Wings history since Zetterberg went 11 straight in 2011. Nyquist became the first player 24 years old or younger to lead Detroit in goals (with 28) since 24-year-old Sergei Fedorov (56) in 1993-94. Detroit's lines have remained balanced and productive, and the return of Datsyuk on April 4 after sitting more than a month because of inflammation in his right knee has been a seamless and energetic boost. Daniel Alfredsson, the organization's prized offseason acquisition, has provided leadership and some scoring punch in a young lineup. The young players making significant contributions were Tomas Tatar, Justin Abdelkader, Joakim Andersson, Tomas Jurco, Riley Sheahan, Luke Glendening, Darren Helm and Nyquist. Despite their youth, they have had success as a group. Tatar, Nyquist and others played a big part in the Calder Cup championship won by Detroit's American Hockey League affiliate, the Grand Rapids Griffins, in 2012-13. Even at 37, Chara is as dominant a defenseman as there is in the NHL. Although all the rigors of his years in the League and the extra exertion of playing in the 2014 Sochi Olympics slowed Chara at times, he was mostly on top of his game against the top opponents all season. With Seidenberg out for the season with an ACL/MCL injury, the Bruins will have to find Chara a new postseason partner. During the regular season, second-year defenseman Dougie Hamilton and veteran Johnny Boychuk took the bulk of the shifts next to Chara. The Bruins will probably base their decision on matchups. Each is a solid options, but come up a tad short of totally replacing Seidenberg. Seidenberg's and Adam McQuaid's injuries opened up playing time for Matt Bartkowski and Kevan Miller. Bartkowski's high-risk game has come with its expected dose of struggles, but he has improved throughout the season. Miller, an undrafted free agent signee, admirably replaced McQuaid's size and physicality in the lineup for most of the second half. Torey Krug, who along with Hamilton, Bartkowski and Miller is one of four defensemen in Boston's top six in his first or second year in the League, continued his offensive exploits from the playoffs last season and improved as a defender. If the Bruins have injuries on their back end like they did last season or need to shake things up, veteran Andrej Meszaros is available. Niklas Kronwall was Detroit's leader on the back end, providing a physical and offensive presence. He was among the Red Wings' best in hits and blocked shots, and posted his highest point total in five seasons (49). He led Detroit in average ice time for the second straight season (24:18). The effort put forth by Kronwall shouldn't be taken for granted since the Red Wings learned in March that Jonathan Ericsson (finger surgery) would miss the remainder of the regular season and potentially part of the playoffs. Brendan Smith has filled in as Kronwall's partner and has provided consistency. Jakub Kindl progressed last season and has proven to be an everyday performer in 2013-14 with usual partner Brian Lashoff. Smith and Kindl were two unknowns entering the season. They each exhibited flashes of their potential in the past but questions remained whether or not they would be able to contribute on a regular basis over a full 82-game season. Each has established career highs for points in a season (19 points). Danny DeKeyser, who was signed as a free agent from Western Michigan University in March 2013, also provided skill and depth along with veteran partner Kyle Quincey. DeKeyser and Quincey each have more than 100 blocked shots, and Quincey is among the top five on the Red Wings in takeaways. Rask is expected to receive major consideration for the Vezina this season after he was left out of the top three a season ago. And at 27 years old, it's unlikely he will be left out of that group for a long time to come. Rask never showed any wear from carrying the Bruins to the 2013 Stanley Cup Final in June, and instead built off his stifling performance with a great season. Rask, who won a bronze medal with Finland at the 2014 Sochi Olympics, is a calming influence behind the Bruins defense and a source of confidence for all the players in front of him. Although most nights the Bruins don't ask Rask to be a difference-maker, he has shown the ability during subpar performances by his teammates to single-handedly win a game. His time as a starter on a team that went to the Final and a backup on a team that won the Stanley Cup has taught him what it takes to finish the job in June. Rask should be well-rested because backup Chad Johnson thrived in his first full season in the League and put up numbers similar to Rask's in a smaller sample size. Detroit's Jimmy Howard has battled hand and knee injuries, the flu and some inconsistent play behind a relatively young team this season. Through it all he remains a fantastic option between the pipes. Howard was rewarded with a six-year, $31.8 million extension in April 2013. He recently became the 108th goalie in NHL history to win 150 games. Howard is still on the brink of being included among the League's elite. Howard on occasion stole a few games for the Red Wings, and it is something he might be forced to do with more regularity in the postseason. "It's been tough this year watching the young guys and hoping guys get back here," Howard told the Red Wings website. "We've done a good job to keep ourselves above the red line [on the standings board] and watching the way these young guys, the way they've come along this year and the way they've grown, it shows how bright this organization is in the future." Jonas Gustavsson is Howard's backup. The team-first attitude that has become the hallmark of the Bruins dressing room comes directly from coach Claude Julien and is apparent in how the players are willing to sacrifice and accept their roles. Julien has coached the Bruins to a playoff berth in each of his seven seasons. His teams have won nine rounds and the 2011 Stanley Cup in that time. The Bruins' improved health for most of the second half of the season allowed Julien to roll four lines and he'll continue to do that in the postseason. Julien has always been patient with his line combinations and that's continued this season. His forwards rewarded him with productive seasons. Julien was very patient with his young defensemen in the regular season and will find out if that pays off in the playoffs. No team is going to take the Red Wings for granted no matter where they finish in the standings due in large part to Babcock. He worked with what he had and never made excuses for his team. Babcock has been to the Stanley Cup Final three times, winning the Cup in 2008, and was the gold medal-winning coach for Canada at the 2010 and 2014 Olympics. He pays attention to detail and his players believe in his message. He focuses on the next task and demands the same of his players, directing all their energy on the next job and the role he's created for each of them. Babcock does that as well as any coach in the League. "[Babcock] has done a great job," Abdelkader said. "He expects to win each night, no matter who's in the lineup. It doesn't matter; whoever's in the lineup. He expects us to go out, compete hard and give ourselves a chance to win." The Bruins famously won the Stanley Cup in 2011 with a power play that was a serious weakness and that was an apt description of the work on the man advantage for most of the past few seasons. But this year, things changed. With Krug and Hamilton available to quarterback separate units, Boston was able to move 6-foot-7, 255-pound Chara to the front of the net. An immovable human was one of the major reasons the Bruins suddenly found themselves in the top five in power-play efficiency this season. Soderberg, Eriksson and Iginla also brought power-play productivity and creativity that was previously lacking. For a team that preaches defense, the Bruins sometimes struggle on the penalty kill. But Rask's goaltending ensures any slumps are short, and Chara and his teammates have done their best to make up for the absence of Seidenberg's shot blocking and rugged defensive play on the back end. Bergeron and Marchand (a shorthanded-goal specialist) lead a stingy group of penalty killers. The return of Datsyuk can only bolster the power play alongside Nyquist and Franzen. Kronwall led the Red Wings in points with the man advantage and Franzen was the leader in goals. The Red Wings were among the top 20 in power-play percentage, but keep in mind they were without some key offensive stars for much of the season. Alfredsson, who finished among the top five in power-play points on the Red Wings, played a big role on the man advantage when healthy and will continue to do so in the postseason. Detroit ranked among the top half in the League on the penalty kill, which is quite an accomplishment considering the Red Wings were without two of its most effective penalty killing forwards in Datsyuk and Zetterberg for large chunks of the season. Patrice Bergeron -- Bergeron will garner a lot of attention for the Selke Trophy as the NHL's best defensive forward. The 2012 winner of that award, Bergeron again earned that consideration with a great season. He's among the best in the League at puck possession despite earning the toughest assignments at even strength from Julien. He's also great in the faceoff circle and on the penalty kill. This season Bergeron was able to regain the scoring touch he showed when he was a supporting player after making the jump straight from the Quebec Major Junior Hockey League to the Bruins as a teenager. There might not be a more complete player in the League. His valiant effort from Game 6 of the 2013 Cup Final, when he battled through a punctured lung, broken rib and separated shoulder, has become the stuff of folklore in Boston. Bergeron's two-way game puts the Bruins in a position to win any series. Jimmy Howard -- If the Red Wings can get the goaltending they need, and certainly Howard has that capability, they will be a tough out. He is 20-22 with a 2.57 goals-against average, two shutouts and .918 save percentage in 42 playoff games. Howard need not be unbeatable, but just consistent. A few defensive lapses from time to time have contributed to his subpar season, but those are precisely the moments when Howard needs to be strong and confident in bailing his team out of trouble. The Red Wings rank among the bottom four in goals scored of the eight Eastern Conference teams that qualified for the playoffs, so Howard could be the key to a long and successful playoff run. Bruins will win if … Barring any unforeseen scoring slumps or disasters (like an injury to Rask), the Bruins' only concern in the postseason will be the young defensemen and how they respond to being key performers. Hamilton, Bartkowski and Krug filled in admirably last season, but there's a big difference between jumping fresh into a successful situation and facing teams that have had a year to scout for weaknesses. If the young defensemen continue to limit their mistakes, the Bruins should have enough offense and goaltending to advance. Red Wings will win if … The young players continue to excel in pressure situations, Datsyuk and the other veterans pave a path for them, and Howard remains consistently sharp between the pipes. If Zetterberg can return from his back injury at some point, that would provide a shot of adrenaline throughout the lineup. Zetterberg ranks third among active players with 55 postseason goals, to go along with a Stanley Cup and Conn Smythe Trophy. Alfredsson has 51 playoff goals in 121 games to rank fourth among active players; Johan Franzen has 42 playoff goals and Datsyuk has 36.